It's hard to believe that it has been two years since I first invited a group of awkward bloggers who didn't know each other to get together for brunch! From Sissy's Southern Kitchen to The Rustic to Americano, we have eaten our way around town and made some lasting friendships along the way! 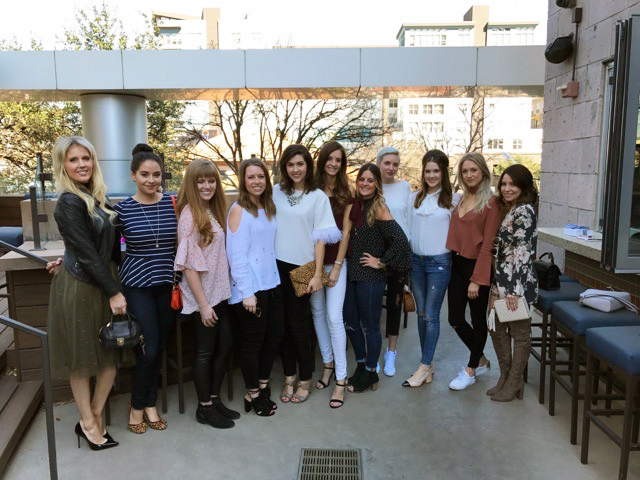 I wouldn't be doing what I am doing now if not for Dallas Blogger Brunch, so I owe a special thank you to all of the girls who have ever brunched with me and to all of the wonderful restaurants who have hosted us for Dallas's favorite meal! For this special birthday brunch, I decorated the table with birthday cakes and confetti, of course! These festive cakes were provided by The Hospitality Sweet and made our table feel birthday-ready! Instead of our normal floral arrangements, I used multicolor confetti to liven up the table and add birthday flair to the decor. Each of our guests received a special (and comical) birthday gift from Poo-Pourri, which added to the birthday feel of the brunch. To make our place card holders, I used regular sized party hats and cut them down to miniature size then cut a slit in the top of the hat to hold the card. It didn't take me long to "diy" 12 hats and glue a pom-pom onto each hat, but the impact to the table is huge! These adorable gold calligraphy cards were done by Katie of 26 Letters Calligraphy and were the perfect classy touch to keep the brunch table from looking too juvenile. You may have noticed that I normally order the french toast, but I decided to mix it up this month and I ordered the Spicy Chicken and Waffles! The slight spice in the maple syrup added the extra kick that set this dish apart from other restaurants and I was very pleased with my choice. I wish I had room for more food because the Red Velvet Belgian Waffle was also a hit and everyone who ordered it cleaned their plate! It is always a treat to brunch with a lovely group of bloggers, but this month was especially fun to mix old and new faces together to celebrate our birthday! Thank you all for following along on our brunch journey! Special thanks to Del Frisco's Grille for hosting this month's brunch. Place cards by 26 Letters.